I was originally going to do a write up of last night's Grammys, but after watching 3 1/2 hours of nonsense you can pretty much sum up the night in just a few words: Adele is a goddess. Nicki Minaj is garbage. Enough said. Let's move on to a better event, shall we? With only a few days left, New York Fashion Week has already shown the world some pretty fantastic stuff. Some greater than others - in fact there have been a few standouts that make my list of Best Fall 2012 Collection. Here they are in no particular order. Prabal Gurung's collection seemed to have an edgy dark side, but with just a few moments of softness that literally took your breath away. Colorblocking dominated the BCBG runway with a mix of rich colors. Jason Wu's collection consisted of luxurious garments inspired by his trip back to China. It was glamour all the way at the Monique Lhullier runway. Decadent evening gowns with va-va-voom moments. Sticking to her motiff of sweet, feminine, and delicate, Honor's runway was nothing short of lovely. Rachel Zoe continues to send what looks to be her own wardrobe down the catwalk - Good thing I love her, and her 70's inspired Bianca Jagger looks to pieces. Do you agree/disagree with my selection? Before you go, I would love it if you take a moment and vote for me at Circle of Moms Top 25 Fashion and Beauty Moms. Thanks for your votes lovelies! Haha! Nicki Minaj looked ridiculous while Adele looked sophisticated and classy! I love Adele. She looked beautiful, unfortunately I can't say the same about NM. I totally agree with the Grammys. 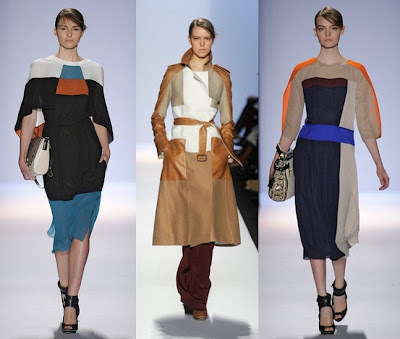 I love all the collections you listed above, with my favorites being Rachel Zoe, Jason Wu, Prabal Gurung. You're welcome! Glad you enjoyed them! As far as the grammys, all I can say is that Nicki Minaj lost her damn mind yesterday. Agreed...Zoe's designs are very her...but I always want to wear them! Me too. I love her esthetic! Totally agree. The Monique stuff is just insane. Monique and Rachel collection I can see myself wearing them ^_^ Awesome picks!